The loop roads around Pretoriuskop are ideal for early morning and late afternoon drives because of their proximity to the camp. The Fayi Loop (S14) around Pretoriuskop is a good location for the Black-crowned Tchagra, an energetic little bird which hops about between the lower thickets and the tree canopy from where it emits its distinctive 'for he's a jolly good fellow' call. When perched, it sometimes makes a curious, twirling motion with its closed tail. The most common bird here is the Fork-tailed Drongo. A good birding challenge in the Pretoriuskop area is to try and spot the colourful bush-shrikes which inhabit the thicker shrubbery - they are more easily heard than observed. The Gorgeous Bush-Shrike should be easy to see with its bright red throat and black bib, but it hides under dense cover from where it emits a two syllable kon koit . The Grey-headed Bush-Shrike has a mournful, drawn-out whistle which it can repeat up to 50 times. The Black Cuckooshrike is a less common Kruger bird, but is sometimes seen around Pretoriuskop. An excellent late afternoon drive is around Shabeni Rock on the Albasini Road (S10). The Lizard Buzzard is sometimes seen around Shabeni, an enormous granite dome with dense thickets at its base. These may conceal the Gorgeous Bush-Shrike, Mocking Cliff-Chat*, Southern Boubou, Lazy Cisticola and Brown-crowned Tchagra (which has the same eyebrow stripes as the larger Black-crowned Tchagra, but has a brown crown, not a black one). Freckled Nightjars also nest in the vicinity of Shabeni. Mestel Water Hole is a bit far from the car park for close-up sightings, but there is sometimes interesting birding activity in the bush around the water hole. The Albasini Road (S3) between Pretoriuskop and Phabeni is a scenic drive through the terminalia/bloodwood forests, past the giant, granite protrusions which mark the edge of the escarpment. This is an area for unusual sightings - it's sometimes so quiet that anything you see is unusual. The Fork-tailed Drongo is probably the most conspicuous bird along this road until it joins up with the main Skukuza-Phabeni Road (H1) near Phabeni Gate. Here things get busier because the Sabie River is close by and the underlying gabbro supports rich, open grassland. Chris Patton has seen flocks of Retz's Helmet-Shrikes* here - right on the western edge of its range. Identifiable by its red eyes, red bill and dark head, Retz's Helmet-Shrike* moves around in small, cohesive flocks, feeding for insects in the canopies of trees. It is fairly common throughout Kruger and is often seen in the mopaneveld. The rare sable antelope is sometimes seen along this road. Pretoriuskop is the only camp in Kruger where exotic trees have been allowed to grow. These were planted by Park ranger Harry Wolhuter who is more famously remembered for his remarkable courage in killing a lion that had dragged him off his horse. The flamboyants and bougainvillea provide a colourful counterpoint to the indigenous Knob-thorns, fig trees and Marulas in the camp. The Crested Barbet in particular fancies the flamboyants which often have convenient nesting holes. Look out for them - and the Golden-tailed Woodpecker - in the flamboyants between the shop and the restaurant, where their bouts of noisy squawking punctuate the calm camp air. The best birding spot in Pretoriuskop Camp is undoubtedly the mini-forest around the swimming pool which is set amongst flat granite boulders. This is a particularly busy area and usually a good variety of birds can be seen within a half-hour amble. One particularly busy birding tree is the partially collapsed 'Indaba Tree', an old Natal-mahogany under which Wolhuter used to hold his daily morning staff meetings. Among the Pretoriuskop specials are the noisy Arrow-marked Babblers. One spring morning, the authors watched an Arrow-marked Babbler seize a baby night-adder from an anthill near the edge of the camp and devour it within minutes while fending off the attentions of a greedy Cape Glossy Starling. Another raucous bird is the Brown-headed Parrot, which squawks like a machine part badly in need of oiling. It loves fruit trees, particularly the Monkey-orange. The Black-backed Puffback, Red-headed Weaver and Blue Waxbill are also associated with Pretoriuskop. The Fork-tailed Drongo is an aggressive and noisy upstart that is quick to harass large birds of prey, hornbills or crows that stray too close to its nest. Easily recognisable by its distinctive, forked, black tail, the Drongo usually hunts alone, hawking insects from a perch and occasionally dropping to forage on the ground. It often follows humans and other mammals, preying on insects flushed from the grass. It is a skilled pirate, adept at seizing food from other birds. Studies in the Kalahari have shown the Drongo swoops over feeding groups of Suricates (Meerkats) mimicking their alarm calls. When these little animals scatter for cover, the Drongo quickly helps itself to their meal of lizards or beetles. Birding authority Leonard Gill remarked how the Drongo has a 'boldness in attending upon grass fires and catching the insects driven up by the flames'. The Drongo is common throughout Kruger - provided there are sufficient trees for perching on. Besides insects like bees and wasps, it preys on small birds like the Bronze Mannikin. The Napi Road is an excellent birding road through the gentle, rolling foothills of the Sabie River valley system. From Numbi Gate it winds through terminalia woodlands down into open grassland and then over the mini-escarpment from the Biyamiti catchment area into the Sabie River valley and the broadleaf woodland south of Skukuza. The Napi Road is one of the better places in Kruger to see the Gabar Goshawk, described by Liversidge as an 'audacious predator known to take a francolin twice its weight'. The higher altitude grasslands around Pretoriuskop have Drakensberg birds like the Yellow-throated Longclaw. As the road descends into the lowveld, the tree cover thins out and the grasslands open up. This is a good place to test one's LBJ identification skills as there are plenty of warblers, larks, prinias and cisticolas. Grassland birds are hard to identify because of the limited colour range and similar size of the birds, but the more easily recognisable are the Flappet Lark, Tawny-flanked Prinia, Neddicky and Red-collared and White-winged Widowbirds, Common Waxbill, Red-billed Firefinch and Streaky-headed Seedeater*. The rich grasslands around Shithlave Dam attract many seed-eaters. The altitude here is also low enough for White-crested Helmet-Shrikes and Red-billed Buffalo-Weavers. Shitlhave's noticeable birding feature is the large Hamerkop nest in one of the dead trees in the water. These nests, according to Liversidge, can consist of over 8 000 twigs and sticks and can weigh up to 50 kilograms. Shitlhave rarely attracts many water birds because of the lack of protective vegetation around the water hole. A bird that doesn't feel insecure here is one of South Africa's most common waterbirds, the 'Gippo', or Egyptian Goose. This brazen bird has been seen perching on hippos. It is one of the few South African waterbirds introduced into Britain and the Netherlands. The sourveld gives way to sweetveld the further east one travels - a reliable sweetveld indicator is the appearance of Knob-thorns, Magpie Shrikes* and Southern Yellow-billed Hornbills. The conspicuous, shaggy nests one sees from the road are usually social colonies of Red-billed Buffalo-Weavers. Stop off at Napi Boulders (505m). A Spotted Eagle-Owl has frequently been seen here late in the afternoon on overcast days, while the Square-tailed Nightjar is sometimes seen at dusk. Besides Shithlave, Transport Dam is the other major water hole on the Napi Road. From here the Southern White-crowned Shrike becomes more apparent, being a bird more associated with eastern Kruger. There is a Red-billed Bufffalo Weaver nest at the Dam that appears to have been taken over by Southern Masked-Weavers. 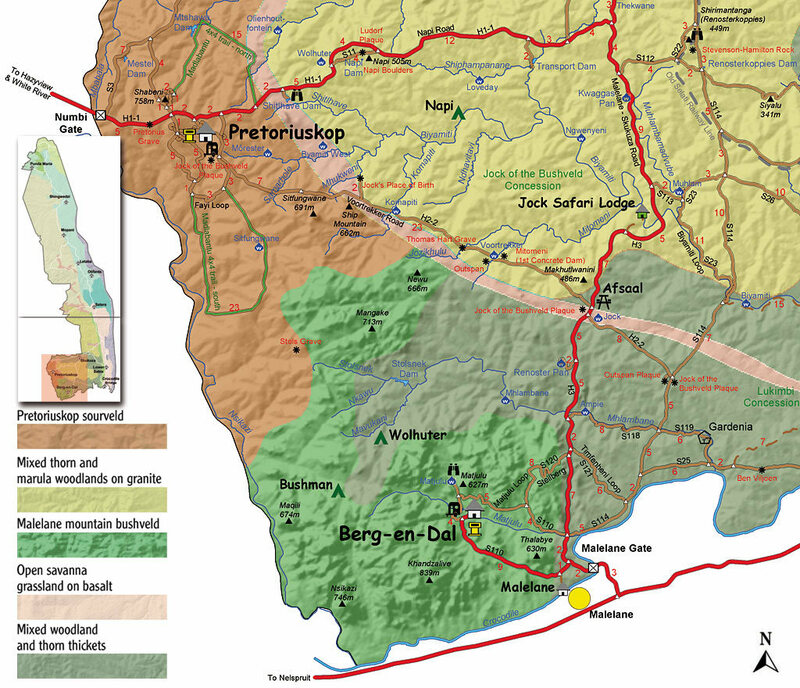 See Transport Dam and The Central - South Road to Skukuza, Malelane to Berg-en-Dal and Mathekenyane and Renosterkoppies. "People in Africa most often see the bird standing in pools of water, staring intently at its reflection. It is, they say, the one who stands alone, who cannot be pointed at, but who points out wizards and has access to their power. Pursued by the wind and the rain, this bird is known as a rainmaker, as a herald of the thunderstorm. The people treat the Hammerkop with elaborate respect, keeping their distance, but watching constantly for omens and portents in its behaviour. Their regard is tinged with fear and coloured by the belief that sometimes, perhaps once in many generations, the Lightning Bird takes it upon itself to appear among them in human form."